New version! Another script After the update to da it seems large portions of the script weren't working. The new version works, and on more pages. The styling is slightly different. The bar that the buttons was added to is now in its own draggable div, and more cases are handled (journal pages, thumbshare forum, user galleries). Also, I didn't have enough time to add in some oauth functionality - but for those that want to get all deviations uploaded by a certain users (as an example), a good place to start would be www.deviantart.com/developers/ especially the developer console. ThumbCollect is a script for Deviantart that allows you to quickly collect the thumbnail codes and/or usernames from most places on the site. Four buttons are added to the top navigation bar (beside your username) to allow you to select thumbcodes or usernames. 'Thumbs' shows all the thumbnail codes on the page. 'Picked' shows the thumbnail codes that you have collected. 'Users' shows all the usernames on the page. 'Picked' shows the selected usernames. By clicking on 'Thumbs', 'Users', or'Picked', a drop down box will appear, allowing you to copy the thumbnail/usernames. Perfect for journal features and more! 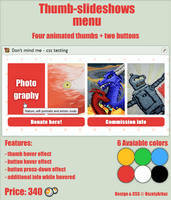 ThumbCollect requires Tampermonkey (Chrome) or Greasemonkey (Firefox). Updated version - looks a bit nicer, and the code is nearly half the size. Also corrects a bug in the old version. Thanks for letting me know about the bug, I'll look into it and hopefully update it with a fix soon. It might have something to do with, when i look at my favorites, it turns on like, infinite scrolling or something. It loads the first "page" but if i scroll down theres nothing. Hm, maybe I'm not using it properly - I can't seem to add anything to the box. The code is downloaded and running - I do see the div + buttons - but I can't click to select and the red/green thumbcode doesn't appear. Any advice? I'm on Chrome with Tampermonkey and do have other dA scripts installed. Edit: Can see/select thumbs in the forums but not in user galleries. My first guess is that the other scripts are causing the way I'm layering the elements I'm adding to get pushed behind something else. Thanks for the help! I disabled the other scripts but still can't see codes anywhere but forums. I'm on Chrome 56.0 and Tampermonkey 4.2.7 on a Mac (10.12.1). Might be the Mac thing but I haven't had problems with compatibility on Tampermonkey before. Thanks for looking into it! c: I've been using it on the pages where it does still work and it's a life saver. Much appreciated! You're a hero. Works perfectly! Thank you! This works great! Thank you so much! The update looks great! I'm not experiencing any problems atm, and the minimalistic look makes me feel so 'organized' lol. Premium Members are able to schedule their submissions. This is extremely helpful if you do regular articles or if you are away for some time, but still need to post things. Or, if you are like me and tend to forget things, and want to make sure that certain submissions will be posted at a special day/time. Scheduled submit is possible for journals and deviations. First thing you have to do, is to prepare your deviation. If you have done so in Sta.sh click the "Submit to deviantART" to get to the actual submission page. If you have added your deviation via "Submit Art" from the menu you are already there. At the top right you can then see the "Schedule" button. All of you should be familiar about correspondence messages in your message inbox. You receive them when members or admins requested your drawing to their Groups or invite you as admin/member of a group. They are messages asking you for permission if you want to be a part of a group or if one of your drawings may be submitted to their group gallery. But you are also receiving correspondence messages when you request your drawing/journal in a group gallery or request to join in Groups. Customising your deviantART gallery allows you to display your artwork in a way that suits your own individual tastes and style. The right gallery design can also help to enhance the appearance of your artwork. There are a number of premade gallery skins available on dA already but if you're looking to create your own but aren't quite sure how then this guide is here to help you. The information below can be used as a quick reference sheet to help you isolate and style individual aspects of your deviantART gallery. This guide is intended for people of all skill levels but if you're new to CSS then you might like to use this information in conjunction with my CSS guide for beginners. Help with installing gallery skins can be found in my deviantART Customisation FAQ.